Will there be life after pesticides for bowling clubs? If your maintenance program is based around waiting for symptoms to appear so you can kill or get rid of problems like fungal disease, hydrophobic soil and insects, then yes you should be concerned. If however, you have a performance greens program that aims to maintain a healthy living green, alive with soil microbes and with a fine, dense, firm turf surface, you probably haven’t had to reach for the bottle in a while and there’s no reason to think you’ll have to in the future. The fact is, that we actually won’t have a choice, but that is a good thing. It will hopefully awaken the real greenkeeper in a lot of us and force us to work with nature instead of against it. All of this will be good for bowling greens as they will have to be maintained using common sense greenkeeping practices that focus on playing surface performance. The only way I’ve seen to reliably maintain greens for high performance is to work with what we can observe and to work with nature. For too long, too many clubs have been at the mercy of an industry that wants to sell them stuff. The issues we are seeing all over are caused by blind adherence to what we’re told and not looking and learning for ourselves. The industry is of course supported by a huge number of product suppliers and they all have to make a crust. Some of this is good, i.e. we get innovation in equipment etc, but on the product side it causes greenkeepers to get stuck in ruts they find it hard to get out of again. I’m speaking here mainly about the proliferation of using pesticides for every symptom and the continued folly of sand top-dressing without understanding. The fact is I’m not totally against top-dressing and in the work I do in the golf world I’m one of the biggest advocates of USGA greens, so I’m not anti sand either, but there is a very great deal of misunderstanding of USGA greens and the role of sand in rootzones and topsoils. What I am against is blind adherence to traditions regardless of the evidence in front of us. Thatch is largely a symptom of the maintenance practices we have employed, killing anything that moves and making the soil inert, hydrophobic, acidic, lacking in oxygen. Over watered, over fertilised and simply sick. A lot of the greens I see (golf and bowls) have excessive thatch, yet the clubs still follow intensive fertiliser programs, when they probably don’t have to worry about fertiliser for a very long time, other than a bit of Nitrogen when the grass is growing. On greens that have been subjected to the now traditional round of pesticides and sand and where there is almost always deep, dense, matted thatch, there is no time like the present to get started on the Performance Greens Program. Making holes as often as you can to get some air into the soil using deep slit tiner like the Sisis Autoslit or an old Outfield Spiker. This can continue right through the winter until March. Physical removal of thatch would be great if you could, but we’re in the wrong season for doing this well right now. The use of carbohydrates and compost teas to stimulate microbial activity in the soil. Carbohydrates can be supplied by seaweed liquids, diluted beer slops from the bar, molasses and a whole range of carbohydrate rich turf products. Bring the soil back to life and you are well on your way to recovery. No fertiliser except N in the growing season. As much hole making through the season as possible using solid tines, sarrell roller etc. No more sand top-dressing for the foreseeable future; you will come up against it for this, but the argument about top-dressing levelling the playing surface doesn’t hold up when you can make a 1 inch dent in the turf with your shoe. Levels and smoothness of surface are almost nothing to do with top-dressing. • Graden thatch removal with 2mm tines at 13mm (over the top of the cores) spacings to remove a further 15% of the surface. Double cut the green with a hand mower and the green can be played on immediately. You will have physically removed 20% of the green surface and the knock on effect of the sudden oxygen boost will instigate the breakdown of much more thatch. 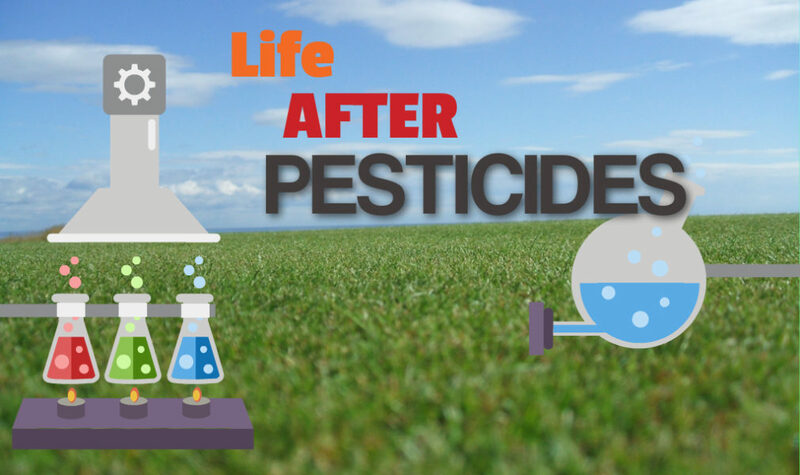 By 2020 we probably won’t have legal access to any pesticides for use on amenity turf in Europe and that will be a good day for greenkeepers. Instead of fearing it, we should embrace it. It takes a lot of nerve to fly in the face of the perceived wisdom of the industry and your predecessors, but it’s the only way to go. What a great article, been using your method for 4 or 5 years now with great success. Have proved the method and can prove the budget savings as well. Our bowls green has been devastated by leatherjackets over the winter months such that we may not play at all during the coming 2019 season. I am a great fan of Bowls Central Performance Greens Programme, and have tried to communicate its merits to our Head Greenkeeper. However, I cannot see how the programme will, or can, eliminate the risk of leatherjackets now that the pesticide has been banned. I understand that building up nematodes in the green is the only answer, and even then not 100% foolproof. We will not be the only green to be trashed by leatherjackets in the years to come. Never mind about revoking Article 50, we should have a revoking of the pesticide ban, with controlled and managed application of the pesticide by licence holders in the short term, whilst nematodes are applied to build up a resistance to Crane Fly attack. The point of this article is to illustrate the futility of continuing to rely on pesticides. Of course leatherjackets can be devastating to the green, but they should never be allowed to get to this level of infestation. Organo-phosphate insecticides definitely aren’t the answer, as like all pesticides they only tackle the symptoms of the problem, not to mention the long term dangers to human health of nerve agents like these, and nematode treatments, although natural, are also dealing only with the symptoms i.e. the current infestation and doing nothing towards prevention. The Performance Greens Programme takes a view that considers the Eco-System of the bowling green (soil, turf and surroundings) and ecology is all about balance. If one organism dominates the eco-system then it is out of balance. It might seem counter intuitive but tackling symptoms only guarantees further problems of the same kind. Killing off leatherjackets with insecticides absolves us of taking note of the underlying issues that attract them. Fungicides kill off beneficial strains, so guarantees a place for more pathogens at the table. More on tackling the problem of leatherjackets and about current trials of natural prevention in a previous newsletter here.